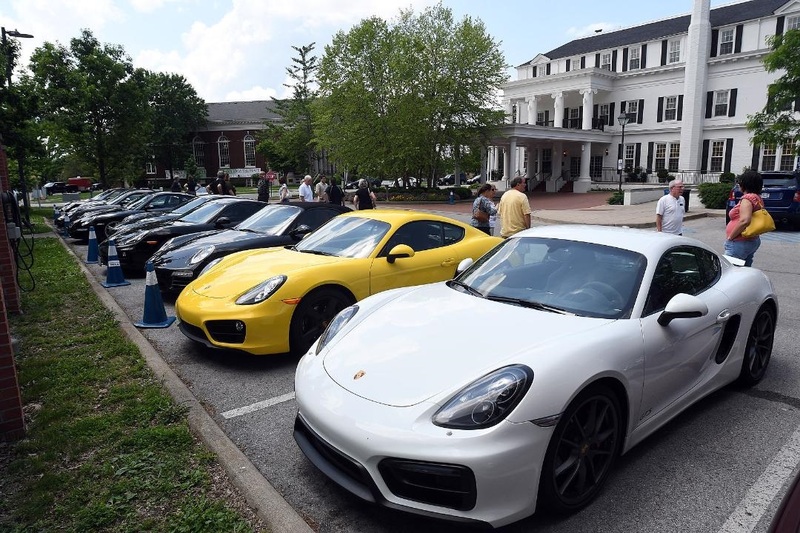 In May, region members enjoyed a driving tour to the Asheville, N.C., area. The July 2018 Steinlifters will cover the event in detail. Enjoy some photos here taken by several members including Karen Gnatzig, Gregg Eisenhardt, Donna Daufenbach and Al Wagner. View from Gregg Eisenhardt's room. Scenic views...beautiful even with morning fog. A sitting room at the Biltmore mansion. Guests back in the day at the Biltmore dined in opulence. Chihuly art at the Biltmore above and below. Tour guide at Woodford Reserve describes the history of the distillery. Tony Quebbemann, left, Ellyn Wagner (center) and Al Wagner (seated) enjoy a laugh while relaxing at the rented house that some members of the group stayed in while in Asheville, N.C. The tour participants couldn't figure out how to get one of these barrels into their Porsches. The gang at the distillery. 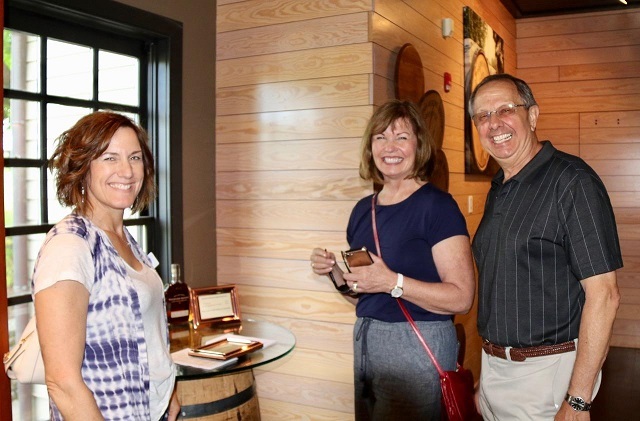 Julie Quebbemann, left, Susie Lindenberg, center, and Jim Lindenberg, are all smiles during the tour stop at the distillery. Clockwise from left starting with man in black tachometer tee shirt: Tunch Turna, Rena Turna, Judy Weltsch (Tim Rehbein’s wife), Tim Rehbein, Todd Ponath, Debbie Ponath, Jo Ann Fraizer (back of head), and Bill Fraizer. dining at Boone Tavern in Berea, KY. The "famous" logging truck that slowed down the group until it pulled over. Bill and Jo Ann Frazier: The day started out cool and overcast, no top down on the 981 Boxster S. As always, getting through Chicago and onto Hwy 65 south toward Indianapolis is and was challenging, but out leaders Al and Ellyn Wagner made it look easy. We encountered a little rain from time to time with a downpour at one point. As the caravan proceeded south the temperatures stayed the same, chilly. Suddenly in southern Indiana, the temperature rose quickly into the 80’s, requiring the top to magically go down. From that point to Lexington, KY, the weather was great. 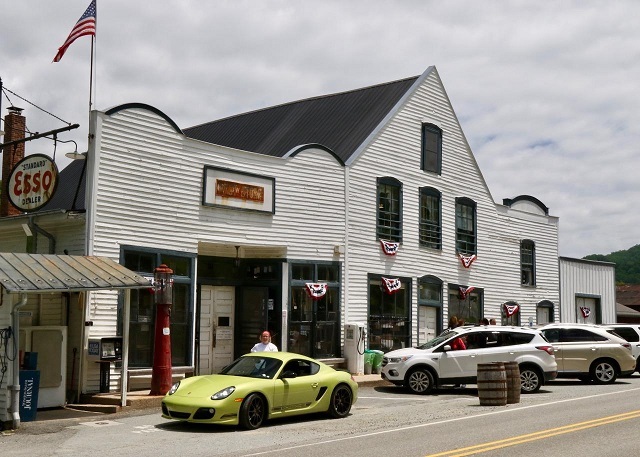 After a great local dinner suggested by and attended by our former famous Café owner and a good night’s sleep we headed out the next morning to Alcoa, TN to the greatly anticipated drive on the Tail of the Dragon which started in Tennessee and ended in North Carolina. Our Tail leader was well experience on the Dragon and kept a very brisk but safe pace, we were right behind him until the last two miles, when he showed his expertise in negotiating the turns, bye bye 981. The Marriott accommodations selected by our leader were well chosen without exception. We were fortunate to get onto the distillery tour due to a cancellation and were very glad we did not miss it. There we learned the proper technique for enjoying a finger or two of bourbon and how a small chocolate pecan candy tastes even better with bourbon. Our favorite restaurant scenery was at the Tapoco tavern, just a few miles from the end of the Dragon. Outside seating along a rushing river assured us that we were on vacation. The traveling scenery was spectacular, each turn more beautiful than the next, with a few straightaways to stretch our 981 legs. Many breathtaking photos were taken at the overlooks where all the Porsches stopped; the mountain scenery was not bad either. We did a little one on one exploring and visited a huge dam near the end of the dragon. A short distance Southwest of Asheville was unassuming highway 151, then there was a sign that said no trucks beyond this point, just like the sign at the beginning of the Dragon. To say the least, the Dragon did not have much on this little stretch of highway, though the Dragon is a little bit more forgiving on the very tight turns dead blind corners. Happily and with a little less rubber, our 981 ended up at the Blueridge Parkway, where we stopped at a mountain top resort, Mt. Pisgah with more breathtaking views. The trip to Blacksburg Virginia along the Blueridge Parkway lived up to its reputation as something everyone should experience. Mixed into the trip was a little detour onto the DIAMOND, another very technical road. The great anticipation of this challenge was immediately dampened by a fully loaded log truck Jake-Braking his was down the mountain; would he pull over for us? We knew that was going through everyone’s mind. After a few miles, the truck driver found a less than ideal spot to pull over but he did, just for us. The driver received waves, thanks and honks from everyone, I hope we put a smile on his face, he certainly put one on ours. Our wonderful experiences, compliments of Al and Ellyn and everyone that we met, were too numerous to memorialize without a publisher under contract. Thank you everyone for the best car trip of our lives. Zeynep Rena Somersan: My husband said that the Tail of the Dragon offered a chance to get the rust off... I said: “The Porsche has rust?” He said “No, all the straight highways and city driving makes our driving skills turn rusty!” 318 turns in 11 miles was awesome and he did it three times. The professional photographers along the Tail allowed us to order some special photos. He is calling this one of the best trips of his life. Richard Schumann and Jo DeMars: I found the trip to be well paced. The frequent stops may have been an added opportunity for delays, but the leaders kept us on schedule and we all knew we'd get to where we were expected on time. Many thanks for the planning that let us know what to expect and how to pace ourselves. I especially appreciated the self-directed time in Ashville that gave us a chance to be as busy or as lazy as we wanted. I suppose no one can take credit for the scenery, but I can't imagine how it could have been any better. The timing of the trip would be hard to improve upon. The challenge presented by the roads had everyone excited and eager for the next leg of the journey. I heard a couple of drivers comment that they increased their confidence and skills. The restaurant locations were each memorable and special in their own way. Whether it was delightful scenery or historical charm, each place was worth the trip all by itself. I found the hotels to be a good choice; the staffs were helpful and welcoming, making us feel appreciated and at home. Finally, thanks for the amazing opportunity to participate in a rally of this size. Just watching the cars pull out in a steady stream was a thing of beauty. Great fun, great memories, great camaraderie. Tim and Judy Rehbein: The portions of the tour that meant the most to Judy and I were: The Distillery Tour, drive on the Blue Ridge Parkway, three-day stay in Ashville and the dinner at the house outside of Ashville. These in conjunction with the fact that all of the planned meals were just excellent as were all the special drives. Tom and Barb Mulligan: We thoroughly enjoyed the Asheville trip. The Tail of the Dragon was a worthwhile challenge as were the other twisty roads just waiting to be conquered by the Milwaukee PCA. While in Asheville we visited the Biltmore Estates displaying the glass works of Chihuly, Spectacular! It was a lot of driving but well worth it and we look forward to the next tour. 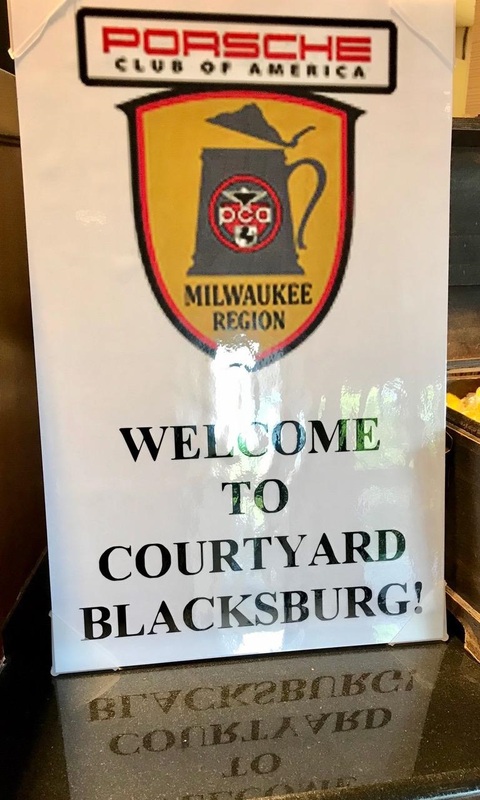 Spending a week together and driving 2,000 plus miles can only be successful if there is a strong camaraderie, which we have experienced in all Milwaukee PCA events. Special thanks to Alan, and of course Ellyn, for all the many hours of planning that made this trip so special, especially the Woodford Reserve Distillery tour and the excellent and unique Boone Tavern, Tapoco Tavern and Over Yonder restaurants. The pizza at the Topoco Tavern was outstanding with its honey infused dough and served by Survivor winner Tina Wesson (how did Alan arrange that?). Alan always ensures that it’s more than just driving on twisty roads. Dan and Pat Johansen: Just to repeat what everyone else has said, it was a great, well-planned trip. 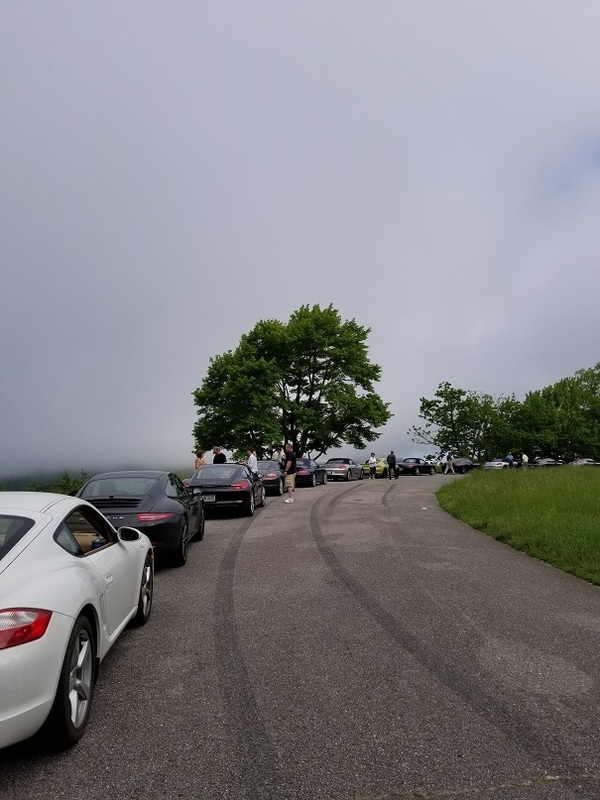 The driving high point naturally was the Tail of the Dragon. An amazingly large contingent drove the tail three times. Just imagine, that's 954 curves in 33 miles. The social experience was extremely friendly and comfortable. Pat enjoyed sharing stories and laughing with the other navigators. Thanks again to Alan for organizing this memorable trip. Jeff Chang: The route planning by Al was awesome. He really went the extra mile in picking roads that would help us enjoy the performance potential and touring comfort of our cars. 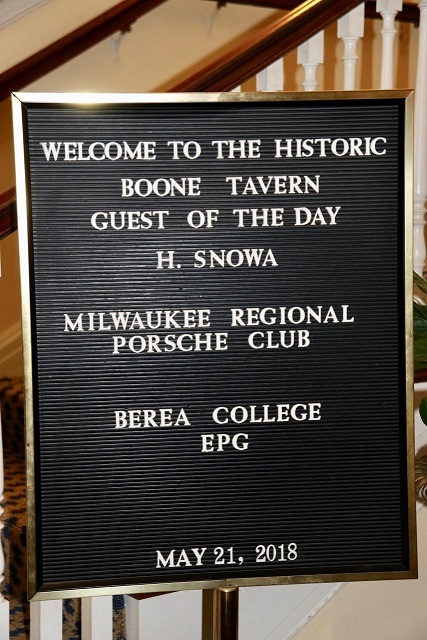 His hotel selections were very strategic, moderately priced, and discreet enough that we wouldn’t attract too much attention, though it was hard to ignore the presence of so many well-cared-for Porsches together at the same location. 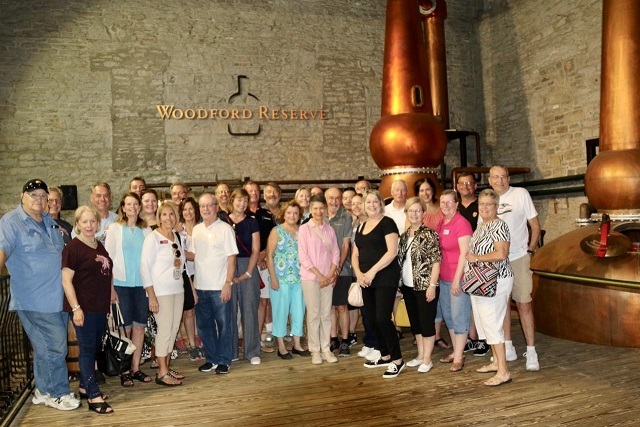 My favorite highlights on the trip were the Woodford Reserve Tour (Bourbon Balls), the Dragon’s Tail (Turns, Turns, Turns), and of course the company (Fire Pit Crew). 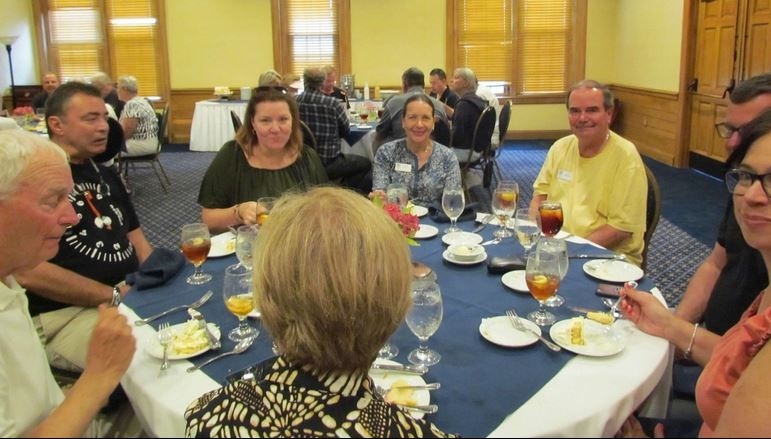 Though I couldn’t stay for the full trip, I would say that I was thoroughly impressed by the kindness, camaraderie, and inclusiveness of my fellow PCA members. You all made this a memorable trip for me and I will not likely forget it any time soon. When’s the next tour? Bob Shellman: The tour was a terrific experience. 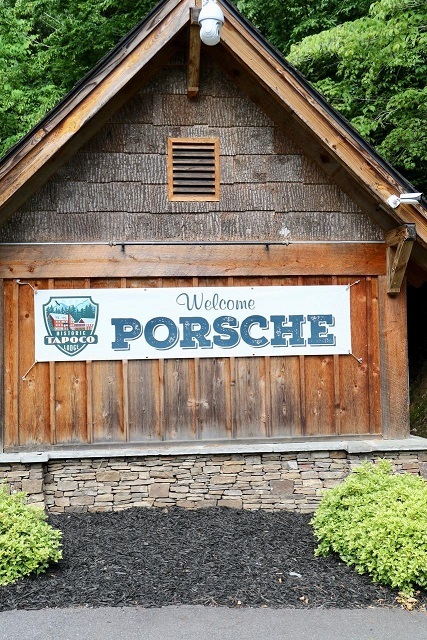 The people, the scenery, the food and of course the Porsches. What I came away with was what an incredible car my 2016 911 is. It was ever so comfortable and easy to drive on the Interstate highways to and from. GT like. On the Tail it was responsive, quick and powerful through the s-curves...a true sports car. On the Blue Ridge Parkway, it cruises at a comfortable pace. With or without the Sport setting I knew what the car would do. I will hold off buying more horsepower until my skill level approaches the level of this base Carrera 911. High compliments to the entire group for their friendliness and in some instances gentle advice or antidotes on a range of subjects....food, cars, tires, restaurants and driving techniques. (We we’re privileged to have several highly qualified driving instructors in the group). Great fun ...and a great job by Al Wagner. Jim and Susie Linderberg: We looked forward to the fire pits at the hotel each night. A bunch of the people would gather around and tell stories of their day and just become better friends. Marty and Karen Gnatzig: The famous Road Master, Al Wagner. Again, Al amazed us with one of his signature trips, planned to perfection. The roads, the sites, the people, all very enjoyable. Everyone worked together as a Team. It was fun. Thanks, Al. Patty and Pat Murphy: There were many delicious meals at the beautiful local restaurants we visited throughout the trip, but our favorite meal was the authentic BBQ dinner served at the rented house in Asheville. The home had an infinity pool that seemed to flow right into the lush green valley that surrounded us. This was the perfect casual setting to tell tales of The Tail, meet new friends, relax, and give Alan a gentle roasting as a well-earned send off for his final successful planning effort. It was a night that will stand out as a highlight of the Asheville experience. Tony and Julie Quebbemann said: Timing was excellent - one week before the official start of summer (Memorial Day) was key in relatively clear roads that were good for driving, despite a well-loaded 10 mph logging truck going downhill pounding out base diesel notes! Good balance on planned vs. free time. 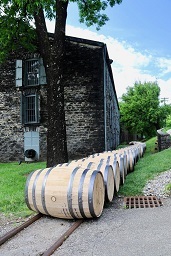 We really enjoyed the planned Woodford Reserve tour as well as the unplanned Biltmore Tour. The mid-week BBQ event provided a very good venue to get everyone together casually and get to know each other better. The tour leader toast and roast gave participants the chance to tell you first-hand how they feel about the trips you have created. Gregg and Christy Eisenhardt: Al and Ellyn outdid themselves once again. Christy and I especially enjoyed the "firepit" chats in Asheville and, of course, the "spirited driving" on both the "Tail of the Dragon" and the Blue Ridge Parkway. Thank you, Al and Ellyn, for so many wonderful and memorable trips. It's not JUST the cars. It's wonderful, friendly people having fun.